Apparently I love making all kinds of turkey crafts so November is a great month for me. The ideas just keep flowing and W is more than happy to break out the craft supplies and help me create new turkeys! I have been wanting to create some activities to help him continue to develop his fine motor skills. So our latest creation is our Clothespin Turkey Roll craft aka how I use those toilet paper rolls I’ve been saving up! If desired, paint your toilet paper roll brown and set aside on wax paper to dry. Paint each clothespin a different color. You could do fall colors for the turkey or go with rainbow like we did. Cut a small triangle from orange construction paper and glue on to be the turkey’s beak. You could also paint one on! Cut a small squiggle shape of red construction paper and glue on side of orange beak. Let it all dry and then have a fun playing! This is a great craft to take on the road if you’re doing any driving this holiday season. Toss it in a zipper bag and little ones can practice clipping while they ride. Depending on the color of the clothespins, you can also work on a number of academic skills. You can work on colors which is what we have been doing. W loves naming colors. You could also pattern the colors. And if you wrote numbers on them you could work on number identification and order! So many great options and these turkeys also look great sitting on the Thanksgiving table! How do you keep your kids busy during the holiday season? Another cute craft idea! Love the rainbow colors used! We do a lot of crafting, book reading, coloring and watching movies and playing games. This is such a cute turkey craft for the little ones. It would be perfect for that time when they have a week off of school. I think I might have them also list something they are thankful for on each “feather”, too! I am in love with your Clothespin Turkey Roll Craft! This is super cute and a great Thanksgiving themed Fine Motor Skills Tool! We have been working with our little one’s Fine Motor Skills during his weekly physical therapy lessons – I may surprise his therapist with a few of these to take to her other patients! Thank you so much for sharing these with us. Really adorable! Love the clothespin I just got rid of some my mom had from back in the day the old time looking ones I wish I could have recycled them. 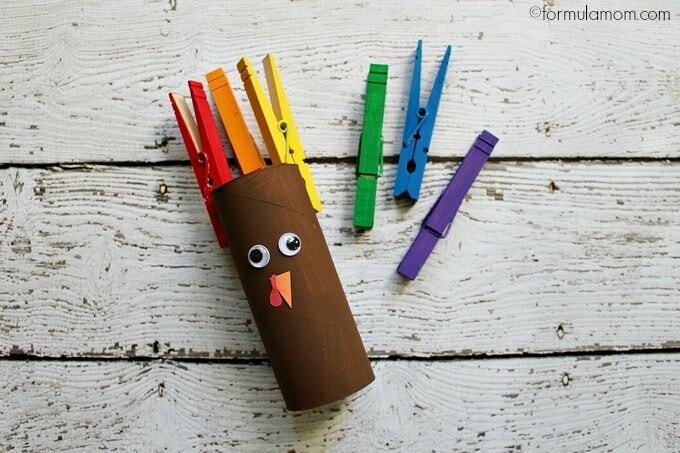 This clothespin turkey roll craft looks like the perfect craft for young kids. My daughter is in charge of the November 4H Cloverleaf meeting so we have been looking for doable craft ideas. Thanks for the tip. That is really cute, and I love the look of the primary colors on the clothespin “feathers” on your turkey! This is so clever and cute, plus I have everything we need to make this! Mariah you are bringing it with the cute turkey crafts!! I’ve got an idea for one that I may try this weekend and add to another blog I work for.. LOL Turkey Fun! Those are super cute! Thanks for sharing. 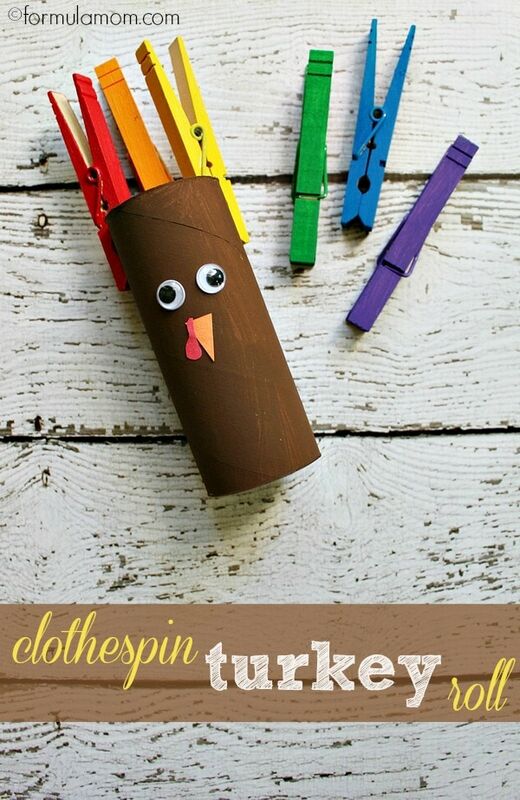 I totally love this cute Clothespin Turkey Roll Craft! All of your simple turkey crafts are adorable, and would be great for my 3 year old son. I especially like how you can create a learning experience from this one with the colors. This is just adorable and I think I could come up with some fun little songs about colors or turkeys or Thanksgiving with it too! Forget the turkey. I love the painted clothespins. I want to just do that. I’m not sure what I’d do with them, but I have to have them. Now these are so cute! I love it! So darn cute! I love to make crafts with my kids. Its a time when I can be all messy and play with them. They would absolutely love this. This is such a cute craft project. It is simple enough for smaller children to and feel confident. Mariah, so loving this cute little craft – perfect for toddlers! I kind of just want the colored clothespin – those are super cute! What a great idea! My 5 year old son is learning sight words, after painting the pins I’ll have him write his sight words on them. He’ll love it! Such a bright and cheery craft.